The LOGO NET is an End Zone Net with a printed logo sewn into the center. The logo section measures 15' x 15'. Made from white micromesh that stands out against the standard black netting that catches the football. From a distance the black netting is invisible to the eye. All the attention is focused on the logo. Use the logo space to showcase team trademarks and websites as well as a premium ad space for game sponsors. Offers a unique exposure opportunity. 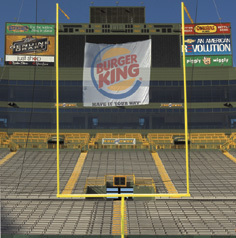 Every time the net goes up for extra points and field goal attempts, the Logo Net will catch the eyes of spectators in the stadium as well as an audience of TV viewers. The Logo Net has a maximum readable distance of 400' and an impact distance of 100'. It carries a message that the whole stadium will notice and remember. Measures 40' x 50' with corner grommets. 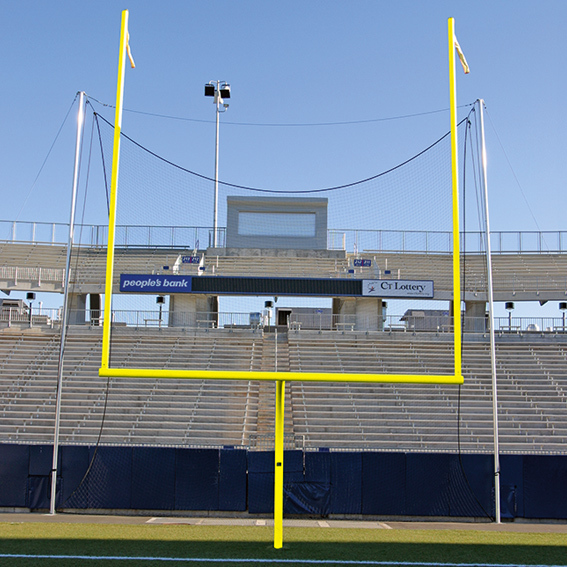 Net size and grommet location can be customized to fit stadium rigging requirements. Customer must supply digital art file. For custom Nets please call Gilman Gear office at 1-800-243-0398 to place your order. If you wish to order blank Nets please proceed with your online purchase.